* All CNC machined from Billet 6061 T-6 Aluminum with Anodized finish. * Soft rubber Contact surface rings provide a soft feel and non slip performance. * Built in Sound enhancing speaker ports. * Works with Standard iPhone 4 & 4S charger plug. * Charges while on the stand in portrait. * Comes in a variety of colors to compliment any taste. 8 Designed, manufactured and assembled in Orange County, California USA. Have you ever tried watching a movie on your iPhone on a plane, at home or at work? Well we have, and that is why we created the Rokstand V.1 Folding Stand. Simple, convenient and compact the Rokstand V.1 Folding Stand is your friend in the air, at home or at the office. 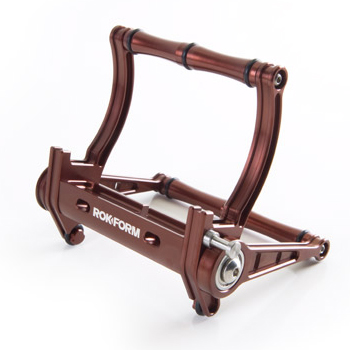 Each stand is hand assembled and inspected to ensure flawless performance; then serial numbered as authentic one of a kind Rokform.